Raising twins, triplets or more is a different experience from raising singleton children of various ages. Parents of twins and multiples will find help and advice for all stages of parenting, from infants to toddlers, tweens to teens. Coping with two or more infants is certainly one of the most challenging phases of parenting multiples. Caring for an infant is a round-the-clock endeavor, and when there are two infants, the demands are doubled. Meeting their needs requires constant effort; both babies need to eat, and there's no possibility of taking turns! The first year is often a time of chaos and exhaustion for parents of multiples, with sleep a scarce commodity and dirty diapers in plentiful supply! But here are some resources that will help you muddle through -- and make the most of -- the first year with twins. First, get prepared for welcoming multiples by stocking up on essentials that you'll need for the first year. Line up help for your newborn twins and be sure you have arranged for a pediatrician so that you can get good medical care for you babies when you need it. 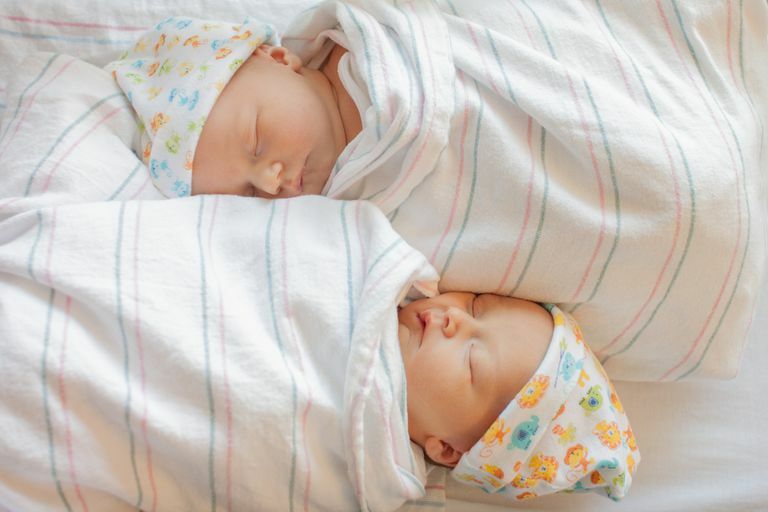 Check out this list of things that you should do before your twins are born so that you and your home are ready to welcome them home from the hospital. As you get into a routine, you may wonder how to feed two babies at the same time. There will be plenty of crying, diapers to change, and cute outfits, but one thing there won't be much of is sleep. Don't worry, it will get easier. Try these ten tips for managing multiples or these hacks for surviving the first few months. After the first year, things really get interesting! Toddler twins and multiples are on the move -- full of energy, exploring their world and learning to communicate. It's important that you make your home a safe place for young twins. They'll spend much of their time at play and soon a multitude of toys will take over your home. You may encounter some new challenges, such as twins that bite or run in different directions, but you can also look forward to getting more sleep and saying goodbye to diapers once potty training commences. It's one of the most exciting -- and challenging -- phases of parenting, but many parents of multiples find that it's just a bit more fun when there's more than one. The school years can bring some interesting issues for parents. You'll have to make some difficult decisions about the classroom placement of your twins, whether they should be together in the same class or separated in different classes. In some cases, you may have to fight for your rights to ensure that the school will honor your preferences. Sibling rivalry can become very heated, but twins can also be the best of buddies. With multiples, your family will be juggling lots of activities like sports, homework, and friendships and sometimes you'll wonder if you spend enough time with your twins, especially one-on-one time. And with each birthday that passes, your twins will be growing up, becoming more independent, and developing their own identities. Having twins or multiples in the family makes for some interesting challenges that other parents don't necessarily face. You're raising same-age children simultaneously, instead of dealing with different ages of childhood. From the logistics of managing more than one to resolving rivalry, parents need lots of compassionate advice. Having multiples can cause strain in the relationship between parents, so take care to nurture your marriage. Support from grandparents is invaluable, especially if there are other siblings in the family. The bond between multiples is an incredible, special thing, but for parents, nurturing it can be almost like having another child! There are lots of tips and strategies on this site for helping your twins or multiples have a healthy relationship with each other, and with others. For example, here are some ways families have dealt with fighting twins. Or you may need help explaining to others how to tell your twins apart. Get tips for disciplining twins when their behavior escalates or dealing with disappointment when things aren't fair and equal. Do twins run in your family? Well, they sure run around the house! From managing mealtime to minimizing mess, moms and dads of multiples need plenty of help in keeping their house in order. There are resources for every aspect of life with twins, from lightening your laundry load to twin-proofing your home to keep everyone safe. Ultimately, you'll learn how to "get it done" with twins, even tips for shopping with twins in tow.